There are nine cover designs for you to choose from. The resource is set up for you to print and go. 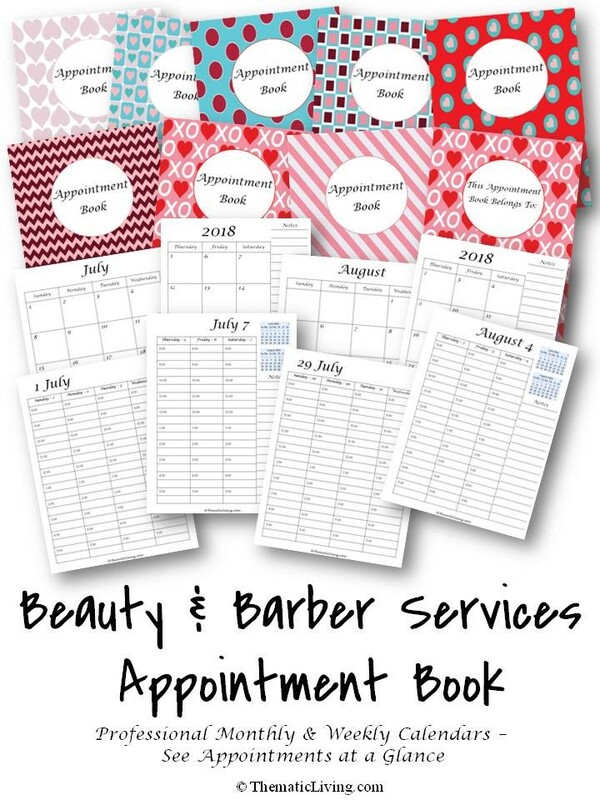 Just choose the cover you like the most, print the entire appointment book (or only the months that you need), and start booking your appointments. The designs include a cover page that reads “Appointment Book” and a back cover page the reads “This Appointment Book Belongs To:”. Just print the entire appointment book front and back for a complete, ready to use resource that can be used throughout the year. Once you purchase this resource, it will be sent to you immediately through a digital download. No more waiting for your book to arrive in the mail or hoping to find the perfect one at your local store! With 9 different designs to choose from, you are sure to find one that fits your preferences. The “Appointment Book” includes a weekly calendar behind each monthly calendar. Both calendars span across two pages so that you can lay your appointment book flat while writing or taking notes. Each weekly calendar page includes time slots from 8:00am to 5:00pm with room to write in half hour appointments (example – 9:30am). There is a section to write notes down the right hand side of both the monthly and weekly calendars. The month before and the month after is included on each weekly appointment page. You can choose to insert your appointment book into a 1 inch size binder or print the pages, laminate the front and back covers, and have the book spiral bound at your local office supply store for a sleek, professional look. Each design comes with its own 1 inch binder spine and each book also includes a section to write in names, addresses, and extra notes. This resource is meant to be used by one person and should not be shared or sold to a third party.